In a large pot over medium heat the olive oil, garlic and add the butter. Once the garlic is golden, remove and discard. Add the ground beef to the large pot. With the back of a spoon break down the ground beef on smaller pieces. Cook until all the juices from the meat are gone. Add the tomato sauce, salt and pepper. Lower the heat, cover and cook for 20 minutes. Meanwhile slice the bell peppers in half lengthwise. Remove all the internal seeds. Clean and dry. Sprinkle with salt and pepper. When the tomato sauce is done, add the rice and mix well. Add the parmesan cheese and mozzarella to the mixture. 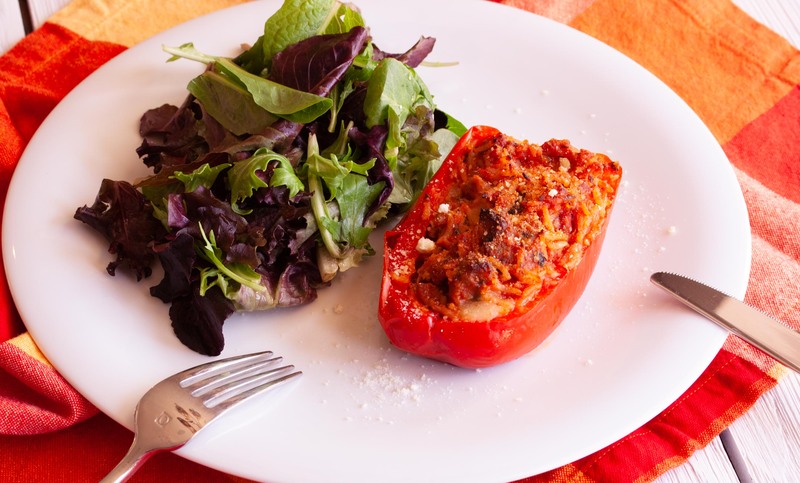 Fill each half of bell peppers with tomato and rice. Sprinkle the remaining 2 tablespoons parmesan cheese over the peppers. Bake in the hot oven for 20 to 25 minutes, until cheese is melted, and the peppers are slightly soft. 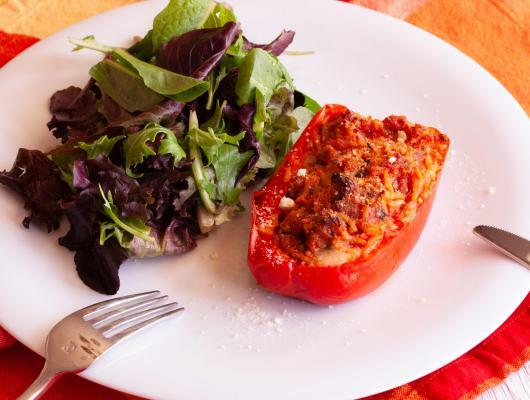 Stuffed bell peppers is, at least at our house, a great way to finish up the left over rice. Somehow I always make extra. This recipe is very easy and simple to assemble and full in flavor. The rice and tomato sauce blend well together as the rice absorbs all the flavors. The cooking part of the peppers in the oven can vary. I like my bell peppers a bit more cooked thus the recipe is reflecting the time. Adjust to your liking.